Amazon.com description: Product Description: Whatever you do and wherever you go, you use language to interact. This text explains what human language is and how it works, giving you a look into the multiple fascinating and surprising facets of this uniquely human trait. You'll find many opportunities to ask your own questions and explore the language in use all around you. About: Whatever you do and wherever you go, you use language to interact. About: Finegan's best selling text, LANGUAGE: ITS STRUCTURE AND USE, Fourth Edition maintains its relevance with new emphasis on the political and social aspects of language including "Applications to the Professions. 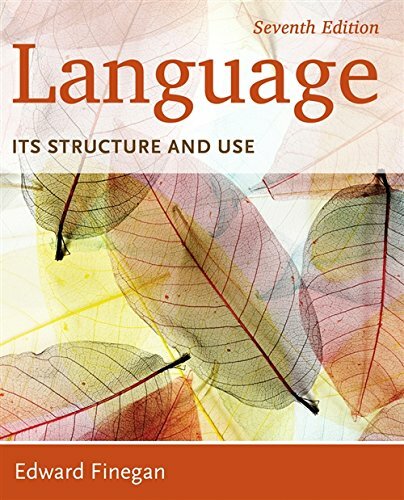 About: The third edition of Language: Its Structure and Use continues the tradition of comprehensive coverage of the core concepts of linguistics found in its first two editions: morphology, phonetics, phonology, stntax, and semantics.